I am thrilled to have an essay, “Fragile Bodies,” in the newest issue of Cleaver Magazine, which went live today. It’s a short, lyric piece of nonfiction about the time I spent working on an organic chicken farm in Florida. 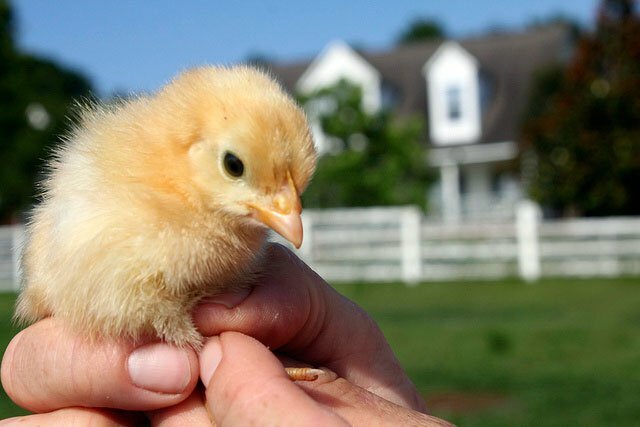 The essay tells the story of a box of baby chickens we picked up at the town’s local post office, and the days those chicks spent getting settled in and trying to survive. When I wrote it my thoughts were occupied with questions about acceptance, cruelty, and life’s many cycles. Oh, and chickens. I was trying to make sense of them too, as is evident in the essay. Rosa stands in the coop’s doorway holding a baby chicken in each of her hands. One of the birds is dying. The other is dead. We might have overlooked the body in the bed of wood shavings covering the ground if it hadn’t been encircled by a dozen other chicks, their feathers warm under the amber light of heat lamps. Yesterday it was an alive, palm-sized animal, toddling around on legs like twigs. Now the body is badly decomposed, everything but the beak flattened, the eye sockets pecked clean. It’s June in Florida. The sun is just rising over the panhandle farm. In this heat, it doesn’t take long for a body to break down. Everything seems to droop and sag. To read the rest of “Fragile Bodies” in Cleaver, click here. To make your way through the Table of Contents for Issue 9 checking out the other work, which I plan to do tonight, click here.